The REAL ID Act is a federal law passed by Congress after Sept. 11, 2001, that establishes specific minimum federal standards for state-issued driver’s licenses and ID cards to be accepted for certain federal purposes, like entering a federal building or boarding a domestic commercial flight. 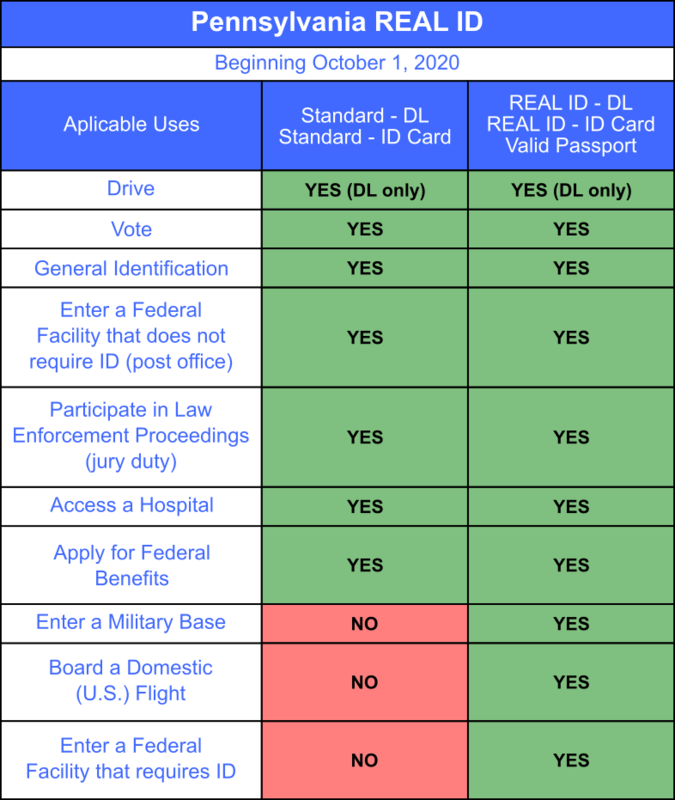 Enforcement of the REAL ID Act begins on October 1, 2020. When do I need to get a REAL ID, if I don’t have a passport and want to us my PA driver’s license or ID card to board a domestic flight? Yes. Current PennDOT-issued driver’s licenses and identification cards will remain acceptable identification for boarding domestic commercial flights as long as an extension is in place. Pennsylvania’s current extension lasts until August 1, 2019. The final REAL ID deadline – the date in which Pennsylvanians will need a REAL ID or another acceptable alternative identification as approved by TSA (such as a passport), is October 1, 2020. No, REAL ID is optional for Pennsylvania residents. You can to get either a REAL ID driver’s license or identification card, or a standard driver’s license or identification card. If you have a valid U.S. Passport or U.S. Passport Card, military ID, or another federally approved identification, you may use this as your form of identification to pass a TSA checkpoint at airports nationwide and visit a secure federal building or military installations at any time. A federally accepted identification (whether it’s a Pennsylvania REAL ID driver’s license or identification card, U.S. Passport/Passport Card, military ID, etc.) must be used as your identification to board a commercial flight or visit a secure federal building on and after October 1, 2020. If you want to use your Pennsylvania driver’s license or photo ID as identification for these purposes, you may want to consider getting a REAL ID. If you know you will not be boarding a commercial flight or visiting a secure federal facility or military base after October 1, 2020 or if you have a valid passport, you do not need a REAL ID. This expiration date structure means that you won’t “lose” time that you’ve already paid for. After the initial REAL ID product expires, the customer will pay no additional fee, beyond regular renewal fees, to renew a REAL ID product. If I’ve recently renewed my license, do I have to pay to renew my license and pay again to get a REAL ID? It is optional and voluntary to change your current license to a REAL ID. However, if you choose to get a REAL ID when they are available, your REAL ID expiration date will reflect any remaining time on your current license, plus four years – you will not “lose” any time that you’ve already paid for. I don’t have my birth certificate, what do I do?